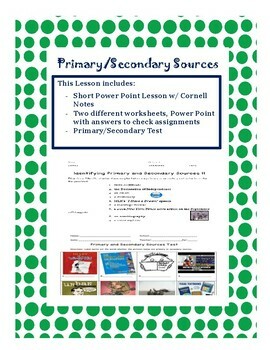 -	PowerPoint that explains primary and secondary sources with a Cornell Notes template for students to take notes. At the end, students will need to answer three guiding questions. -	Next are two worksheets for students to practice identifying primary and secondary sources. -	Each worksheet WS #1 and WS#2 have Power Points that go along with them so that you may check the assignment and have visuals to go with the items. Play the Power Points and the pictures will come up in order of the worksheets. After the students have written in their answers, a click on the Power Point flashes the answer. -	Finally, A visual test for students to complete.